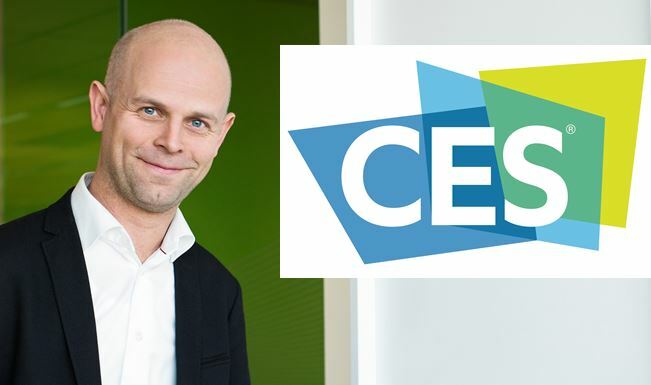 Fredrik Östbye, Strategic Business Development at Telenor Connexion reports from CES 2017. Telenor Connexion’s VP Business Development, Fredrik Östbye, shares his take on the latest megatrends unveiled at the CES 2017. 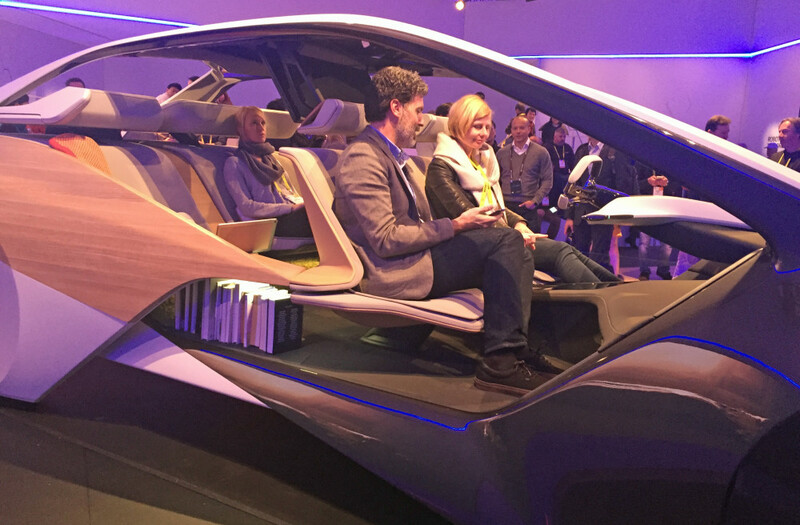 Last week I visited the CES in Las Vegas, where the tech world is showing off what they are working on. 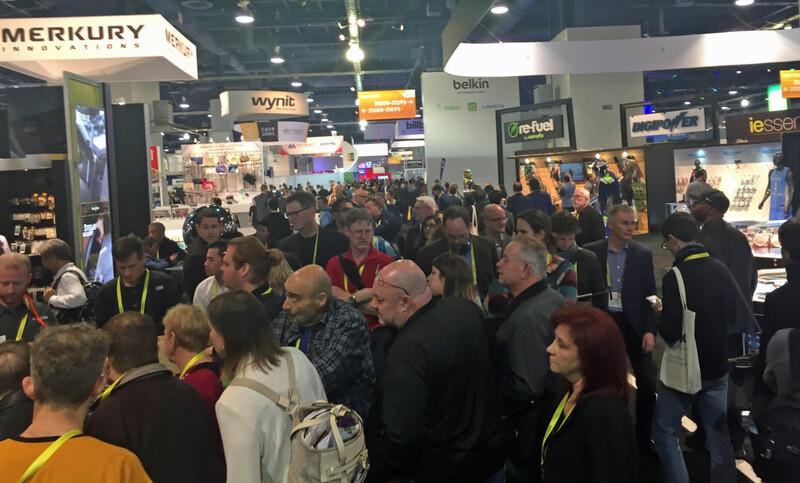 This year, CES hosted no less than 3800 exhibitors and entertained 165 000 attendees. In this post I’ll share 10 megatrends I observed. It’s really amazing to see what the future of technology can bring in terms of development when different industries meet and innovate together to create products for a simplified and more sustainable life. 2017 is definitely the year of partnerships. Titans in different industries combine expertise in order to develop completely new solutions with a speed that would not have been possible should each of them create a solution on their own. Keynote after keynote were delivered describing how the Internet, software, automotive, and the home appliance giants team up to deliver solutions for the future. As examples, Audi and NVIDIA have together developed an Artificial Intelligence (AI) car. Nissan and Microsoft announced a similar cooperation based on Microsoft Cortana. Google and NVIDIA teamed up to deliver a digital assistant for the smart home market, and many more. Nine of the largest automotive OEMs were represented at CES this year. Focus was on how the new disruptive technologies can be used to take the next steps in safety. Statistics show that 94% of all car-crashes are related to human actions. In the US alone, this means that 35 000 lives may potentially be saved by the introduction of autonomous cars (self-driving cars). Furthermore the autonomous cars will decrease costs of operations and positively impact the environment. The entire automotive industry is taking rapid steps in the direction of a new business model. Instead of selling cars, the industry will sell mobility. In their vision, the customers subscribe to movement from A to B with fully autonomous cars owned and operated by the OEMs themselves. This will have a huge positive impact on both time spent on commuting, and on sustainability. An average car is used less than 5% of its capacity and spends most of its time being parked. About a third of the cars driving around in cities are searching for a parking spot. We will get used to the fact that drivers will get more and more help from self-learning, artificial intelligence going forward. In cars, homes, and in most digital applications the technology will create better efficiency, as well as better experiences. As mentioned, Microsoft and Nissan announced a partnership based on Microsoft Cortana for Nissan´s smart car. Clearly Microsoft has set targets on the automotive industry. I also heard talk about other OEMs being on their way to step onboard their new AI-platforms. Imagine a normal day at home when you’re wondering about ‘what’s for dinner’; your kids need help with their homework; and you need to place an order for items to be delivered to your home. All you’ll need to do is ask the questions or place the orders through your digital assistant. Amazon, Google, and Microsoft all presented their digital assistants which will, in the near future, become natural members of many families. Of course they will be based on AI to learn over time how a home is used and adjust in accordance. Your home will be cleaned by robots, the fridge will be stocked, room temperatures will be set, and in general the assistant provides you and your family with extra leisure time. Both LG, and Lenovo announced their versions of similar assistants, based on partnerships with Amazon. Talking about smart homes, NVIDIA and Google announced a partnership with the Google assistant to combine technologies for a smart home, thereby openly challenging Mark Zuckerberg and his smart home initiative. The partnership also included the Samsung SmartThings platform to bring together hundreds of compatible devices that can be controlled automatically, or by simply talking to the new NVIDIA Spot (their version of a digital assistant). Similar partnership announcements were made where both Whirlpool and LG make their home appliances compatible with Amazon Alexa. It seems that the digital assistants finally can crack the code on how to get the smart home market to take off, as it nicely solves the gateway problem. In a similar way to how smartphones have changed our way of communicating during the last decade, Virtual Reality (VR) will do the same over the coming decade(s). It is a truly disruptive technology that will enable completely new ways to interact, play games, experience places and environments that may not yet exist or are out of reach. Imagine a cold, wet, and rainy day, but you want to take a run in the sun at Bondi Beach with your friends; now without leaving your home, you can simply step on your treadmill with your VR-headset on and enjoy the experience. With Augmented Reality (AR), completely new ways of work will be enabled. Combining AR with a digital assistant makes the possibilities even greater. Through your AR-glasses you will be able to see virtual things on top of the real world. For example, by looking at the machine you are about to use, an overlapping image shows you how to operate it. To enable VR, we need 360-degree cameras for the masses. Kodak showed a strong comeback with their brand new 360° camera. Several other vendors have made solutions for retrofitting smartphones. 3D-cameras are also a hot new item, and new mobile phones with built in 3D cameras were presented. Drones continue to be hot. 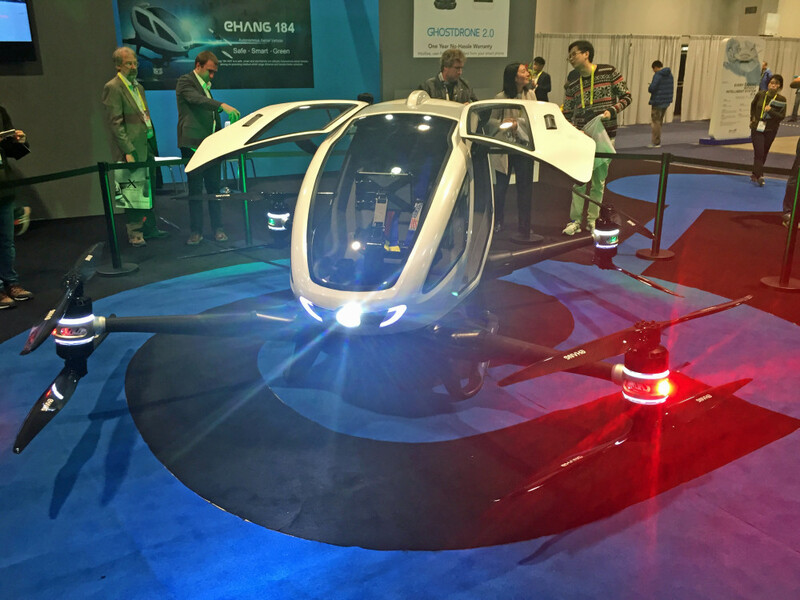 The industry showed drones that can transport people, be used in agriculture, for deliveries, etc. Qualcomm, Ericsson, Huawei, Intel, and others showed how 5G will enable all these megatrends. Trials are already taking place in all the major telco networks with rollouts expected to begin in 2020. 5G is not just an evolution of 4G, it´s a revolution in communication technology, enabling 100 billion devices to simultaneously connect to networks with a latency of less than 1ms and a speed of 10GBit/s. CES hosted a large hall for startups, the Eureka hall, where hundreds of startups showcased their inventions in order to seek investors, partners, and customers. You could find almost anything imaginable. I found one favorite; maybe related to me being a vegan, but I can also see how this one disrupts the way we grow our vegetables in order to feed humanity in a more sustainable way. It looks like a fridge with glass doors and it grows fresh vegetables in just a couple of days! It has an automated system that optimizes nutrition, water, and light using the IoT and AI. It even plays music for the plants to stimulate their growth. Natufia is the name of the startup, if you want to check it out. To summarize my impressions after an intensive week, I have hope for humanity. By using the latest technologies, we can create numerous new business opportunities that will contribute towards a better quality of life and a more sustainable world. For 50 years, CES has been the launch pad for new innovation and technology that has changed the world. Held in Las Vegas every year, it is the world’s gathering place for all who thrive on the business of consumer technologies and where next-generation innovations are introduced to the marketplace. CES is owned and produced by the Consumer Technology Association(CTA)™.